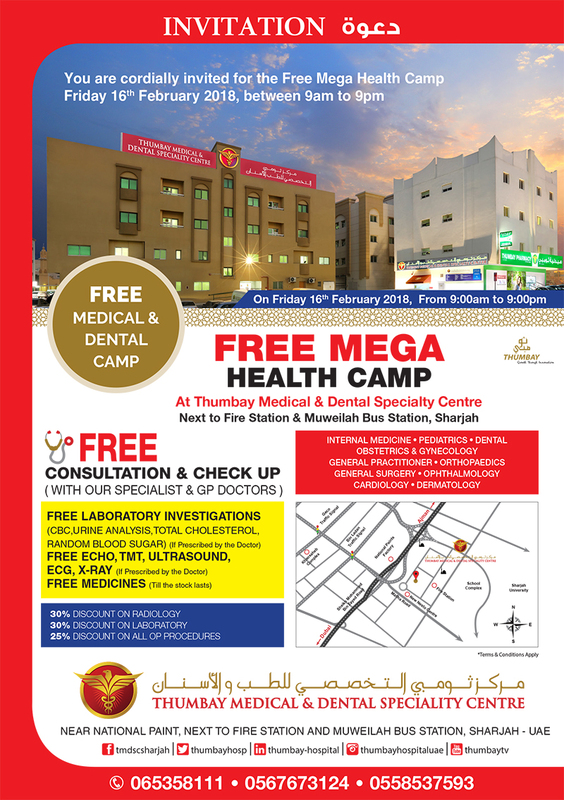 Thumbay Medical & Dental Specialty Centre, Sharjah, the leading academic hospital under Thumbay Group’s healthcare division, will be conducting a free Mega Health Camp from 9 am to 9 pm on Friday, 16th February 2018. “We regularly conduct many such camps as part of Thumbay Group’s corporate social responsibility. With these camps, we aim to help the public gain easy access to superior healthcare,” said Mr. Akbar Moideen Thumbay, Vice President of the Healthcare Division of Thumbay Group. “We invite people from all over the UAE to benefit from the camp,” he added. Thumbay Medical & Dental Specialty Centre has the following specialist departments: Internal Medicine, Pediatrics, Obstetrics & Gynecology, General Practitioner, Orthopedics, General Surgery, Ophthalmology, Cardiology, Dermatology & Dental. For more details, contact: 06-5358111, 056-7673124, 055-8537593.